Preview the 2018 jersey ! Your registration fee will include one jersey for you. Any additional sales help to give jerseys for free to local cyclists and support the Tour's general budget. The 2016 Tour de Quisqueya jersey! This is great gift if not a keeper for yourself. The jersey below is what we wore during our May 2015 exploration of the route. 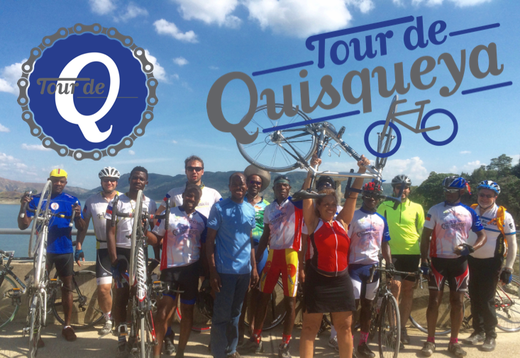 As you will learn when reading about the Tour History, the original name for the project was not Tour de Quisqueya, which it was later changed to in order to better reflect the cultural heritage of the island and her people. You may also click on the image below to be taken to our partner's site where you can purchase Miles of Trees jerseys and bracelets. Proceeds will fund tree plantings as part of the Tour's Social Mission projects.